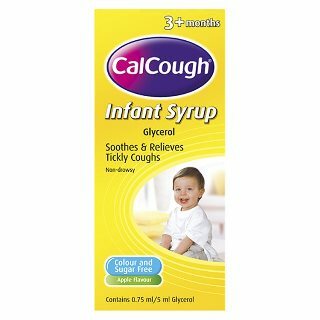 CalCough Infant Syrup is a soothing syrup which relieves the symptoms of dry, tickly coughs. This product is suitable for most people, but a few people should not use it. If you are in any doubt you should contact your doctor or pharmacist. - If s/he is under 3 months old. - If s/he is allergic to any of the ingredients. - If your child has an intolerance to some sugars. Some of the ingredients can cause problems. This product contains maltitol. If you have been told by your doctor that your child has an intolerance to some sugars, contact your doctor before using this product. This should be taken into account in patients with diabetes. Maltitol may have a mild laxative effect. Calorific value 2.3 kcal/g maltitol. Check the information below to see how much medicine to give. Do not give more than the stated dose shown below. Do not give to babies under 3 months. Age: Children 3 months to 1 year. Dose: One 5 ml spoonful. Age: Children 1 - 5 years. Dose: Two 5 ml spoonfuls. Give the dose 3 or 4 times within 24 hours, if needed. Before giving this medicine to your child. If s/he is under 3 months old. If s/he is allergic to any of the ingredients. If your child has an intolerance to some sugars. How to use this medicine. Children from 3 months to 5 years. Age: Children 3 months to 1 year, Dose: One 5 ml spoonful. Age: Children 1 - 5 years, Dose: Two 5 ml spoonfuls. If anyone has taken too much.If anyone has taken too much of this product, contact a doctor or your nearest Accident & Emergency Department (Casualty), taking this pack with you. If you forget to give the medicine. If you forget a dose, give the next dose when needed. Possible side-effects.This medicine is unlikely to cause side-effects unless your child is allergic to the ingredients. If your child experiences any side-effects or you are not sure about anything, talk to your doctor or pharmacist.